This one came with a link to a podcast. There was no “what do you think?” or the “would you share it on your blog?” or anything like that. She just said, “I decided to start my own podcast about the experience of trying to become a lucid dreamer. To keep my mind on the intention of lucid dreaming, and to keep me from giving up.” She has been trying, to one degree or another over time, to lucid dream for around 40 years now, and have yet to succeed. Although unlike the hero of our story, I’ve had lucid dreams before starting my podcast, I in large part also started it for similar reasons, to keep the subject top of mind and to allow me to dive deeper into it. Perhaps it was thinking that the title of the podcast sounded silly to my brain or perhaps being inundated with a bunch of people’s new lucid dreaming “things”, I didn’t check it out right away, but I finally got around to given it a listen, and not only the the podcast’s name made perfect sense, I absolutely loved it. This is not your usual lucid dreaming podcast (not that there is such a thing, there’s barely a handful of them). It is not some instructional guides or interview type of podcast. It is a strange, absurd, crazy, awesome story we get to tag along for. Our hero, named Prodigal D, is a geek after my own heart and a captivating storyteller whose silliness is only matched by her charm. The whole thing is infinitely endearing and absolutely hilarious. I honestly don’t remember the last time I laughed so much listening to a podcast. I can’t get enough of it. 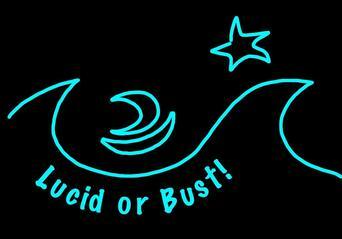 It is nothing like any lucid dreaming something or other out there, and it might not be everyone’s cup of tea, but it is a journey worth going on. I encourage you to check it out: http://www.lucidorbust.com/asleep.html | on iTunes. Thank you very much for this article. This is an amazingly good podcast. Her real name is delightful, by the way. If you leave a comment on her site, she’ll respond. Here it is in late 2018 and I have just found this lovely podcast. It resonates with me a great deal and I am a bit saddened that she seems to have dropped out of sight. I hope she had the success she sought!